Jeffrey Gedmin: "Our Iranian Colleagues Believe in Radio Farda's Mission"
Jeffrey Gedmin has, since February 2007, been president of Radio Free Europe/Radio Liberty (RFE/RL), where he directs broadcasting and Internet operations in twenty-eight languages and where, with an annual budget of just $5.3 million for RFE/RL's Iranian broadcasts, he has revitalized Radio Farda, RFE/RL's Persian (Farsi) service. From 2002 to 2007, Gedmin served as director of the Aspen Institute-Berlin before which he was a resident scholar at the American Enterprise Institute in Washington, D.C., and executive director of the New Atlantic Initiative. He is the author or editor of two books on European and trans-Atlantic relations and was executive editor and producer of the award-winning 1995 PBS television program The Germans: Portrait of a New Nation, and co-executive producer of the documentary Spain's 9/11 and the Challenge of Radical Islam in Europe, which aired on PBS in 2007. He has taught at Georgetown University and is an honorary professor at the University of Konstanz in Germany. He holds a doctorate in German area studies and linguistics from Georgetown University, a master's degree in German area studies from the American University in Washington, D.C., and a bachelor of arts in music from the same institution. Michael Rubin interviewed him on July 13, 2008. Middle East Quarterly: How much airtime do you have in Iran? Jeffrey Gedmin: We have 24/7 web and radio. We have a terrific group of Iranian colleagues. They do a wonderful job of meeting the needs of so many Iranians. To be even more effective, we would need additional funding, above all for salaries for these valued colleagues. We pay our staff in dollars and the falling dollar has hit us hard. Our Iranian colleagues believe in our mission to promote democratic values and institutions. They believe this is patriotism and in the interest of Iran. But they also have to live; they have families, and they are working in a competitive market place. To get and retain the best people, we have to pay competitive salaries. MEQ: Does the Cold War model of broadcasting really apply to a country such as Iran in which so many people have satellite dishes for international television? Gedmin: It's true, technologies have changed. The media environment is more competitive, even in mostly closed societies like Iran. But fundamentals remain the same. We're doing "surrogate broadcasting," providing the Iranian people with news and information their government denies them, information not available through other media. We're using new technologies, too, such as SMS [text messaging]. The regime works hard to jam and block everything we provide. That's one kind of market test. MEQ: How many Iranians listen to Radio Farda? How do you know? Gedmin: Audience research is difficult. Through subcontractors in third-party countries, we collect information through telephone polling. Needless to say, this is an imperfect method because the fear factor plays a big role. We also convene focus groups in neighboring countries. We estimated that, until recently, we had an audience share of more than 13 percent although new data indicates a drop in audience. We are analyzing the data but believe that fear makes it increasingly difficult for listeners to admit they tune into Radio Farda. MEQ: In an ideal world, how many correspondents would you need? How expensive would this be? Gedmin: Our colleagues feel stretched pretty thin at times. We'd be delighted to be able to augment our staff in Prague. We could easily do more, more effectively. We would also benefit from offices in the region, say in Dubai or in Istanbul. It's remarkable what we could do with an extra million dollars or so. MEQ: The Islamic Republic jams your broadcasts, but at the same time, don't they let RFE/RL correspondents operate inside Iran? Gedmin: We do have informal, unofficial "helpers," but Iranian officials do not permit us to have accredited correspondents inside Iran. Last year, one of our colleagues, Parnaz Azima, was trapped for eight months when she went home to Iran to visit her ailing 95-year-old mother. When authorities finally released Azima, they warned her against working for Radio Farda. Since then, an Iranian court has sentenced her to one year in prison for acting against national security. Azima is in Prague, now, but her mother is still in Iran. Iranian authorities have threatened to take away the deed to her home because of her daughter's work with us. MEQ: Are Iranians living inside the Islamic Republic afraid to talk with RFE/RL? Gedmin: Yes. But talk they do through various means. We recently received more than 500 cell phone text messages in just one night from people inside the country. This is another means of communication that Iranian authorities have begun to block. MEQ: What topics does Radio Farda cover that other outlets do not? Gedmin: We'll go after corruption stories in ways others may not. We had something on the sad, bizarre story of dog prisons. Pets were being confiscated by authorities, ostensibly because pet dogs do not conform to the mullahs' vision of Islam. We've done hard-hitting reporting on fuel rationing. Of course, we cover human rights, reporting on demonstrations and arrests; we also cover women's issues. MEQ: With so many competing interests, how do you determine what should get airtime? Gedmin: Our journalists and editors need to be quick and nimble. Farda covers health, culture, politics, the economy, human rights. If the leader of a bus drivers' union is arrested in Tehran and nobody else covers it, then that's our story. About 80 percent of what we do is domestic. We're a "surrogate broadcaster." We seek to provide the news and information that Iranians would have if their government permitted them free, independent media. We do cover some international topics, too. Recently, though, two of our senior colleagues from Farda conducted an exclusive interview with Secretary of State Condoleezza Rice on American policy toward Iran. It's generally Voice of America, however, that covers news about the United States and U.S. foreign policy. MEQ: In the past, people dismissed Radio Azadi, Farda's predecessor, as "Radio Khatami" because of the alleged pro-Khatami slant of its reporting. Was this a fair criticism? How does Farda conduct quality control to ensure that its reporters and producers do not let their own political persuasion impact reporting? Gedmin: It's hard for me to comment about Radio Azadi. I was not here at the time. But the larger question is an important one: It's part of the challenge of so-called émigré broadcasting. We have a healthy range of political opinion inside Radio Farda. Our staffers, whether hawks or doves, conservatives or social democrats, all want decent, accountable rule-of-law and respect for human rights in Iran. That's the way it should be. The pluralism inside our Persian service is reflective of the situation inside Iran. At the same time, our programming can't be held hostage to one particular approach or point of view. We have strong editorial leadership, internal supervision, and external monitoring to ensure we maintain our journalistic and moral compass. MEQ: Do you think Western news agencies covering Iran practice self-censorship? How does RFE/RL balance access versus truth? Gedmin: Yes, I'm fairly certain they do. I think it's what journalists quietly call "visa journalism." Everybody knows you don't get in and get access unless you practice a certain amount of self-restraint. It's a dilemma, and it's true we suffer because we aren't permitted inside the country. It is also an advantage, though; the regime cannot throw us out. Having said this, Iranian authorities regularly find ways to harass our journalists in Prague. It takes courage for our journalists to do what they do. MEQ: How does the regime harass your journalists in Prague? Gedmin: The Iranian government will summon one of our journalists to come home to face charges before a revolutionary court. If they refuse to go, the government requires bail. If the journalists decline to pay that—a figure ranging from US$50,000 to $100,000 dollars—then the government will often threaten to confiscate the property of a relative. MEQ: Iran is an incredibly diverse country linguistically. The official language may be Persian (Farsi), but significant minorities speak Azeri, Kurdish, Baluchi, Gilaki, and a host of other languages. Should U.S.-funded media broadcast in these regional languages? Gedmin: We are considering broadcasts in Azeri to Iran. What's important, though, is not to play into the hands of the regime. Radio Farda is not anti-Iranian and does not promote separatism. We are having an interesting conversation with our Farda colleagues about how one supports minority rights without threatening—or being seen as threatening—the unitary Iranian state. The Hidden Hand: Gorbachev and the Collapse of East Germany (Washington: American Enterprise Institute Press, 1992); European Integration and the American Interest (Washington: American Enterprise Institute Press, 1998). 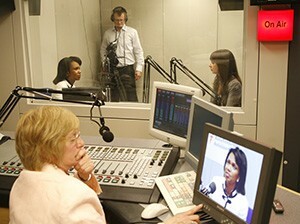 "Full Transcript of RFE/RL Interview with Condoleezza Rice," RFE/RL (Prague), July 8, 2008. Related Topics: Iran, Media | Fall 2008 MEQ receive the latest by email: subscribe to the free mef mailing list This text may be reposted or forwarded so long as it is presented as an integral whole with complete and accurate information provided about its author, date, place of publication, and original URL.